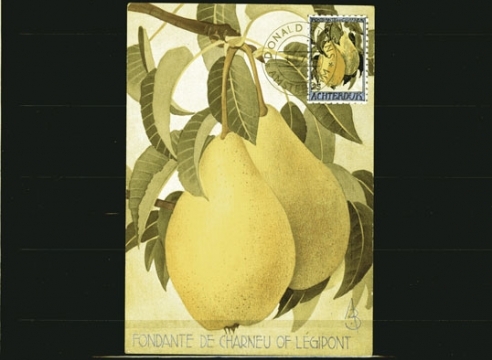 Pears of Achterdijk (Fondante de Charneu of Legipont). 1934. Mangiare. Fruits and Vegetables. Arms of the provinces of Pasta. (Lula Cay and Lessens Trops). 1900. Fauna. Puffin in Flight. The gallery is pleased to present an exhibition of watercolor stamps of imaginary countries by this remarkable artist, who, since his untimely death in a fire at age 31, has remained a cult-figure, both here and abroad. Evans began painting stamps of imaginary countries as a child and a novice stamp collector, and revisited and developed the concept as an adult, as he traveled the world, eventually settling in Amsterdam. Evans’ imaginary countries are complete with their own history, geography, currency and customs. 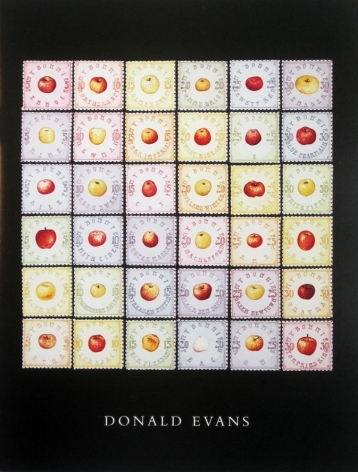 The artist recorded each stamp series in his Catalogue of the World, organizing the work as one would an actual stamp collection.